A qawwali sung by Sachin Dev Mika, Bob Rhymes starring them and Zorawar Singh. The video of this song is available on YouTube at the channel Music Manoranjan. This video is of 4 minutes 20 seconds duration. 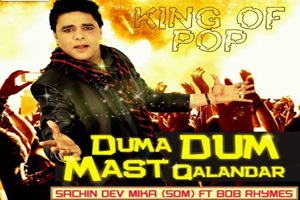 Lyrics of "Duma Dum Mast Qalandar"